Ghost, the albino, is the runt of the litter of six direwolf cubs discovered by the children of House Stark. Ghost is adopted by Jon Snow. 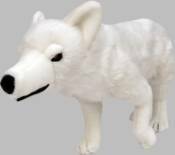 Now you can own Ghost as an adorable plush cub, which stands 9' tall.